GCC member Amanda Ashby has two books debuting this summer, and both sound absolutely adorable. I mean, what preteen wouldn’t love the power to grant wishes? 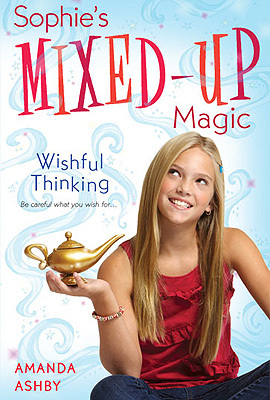 Check out WISHFUL THINKING and UNDER A SPELL, two books in her new series published by Puffin. Amanda: I’ve never been a bridesmaid! I’m from a small family so there were no weddings growing up and not that many of my friends have had traditional marriages (not to mention the fact that I move countries a lot). However, now I feel like I’ve missed out on a rite of passage and I feel like I should invent a game called Bridesmaid Party and make everyone wear really bad dresses! Amanda: I’ve never based characters on real people but I definitely take snippets of myself and put them into books (Malik, who is Sophie’s ghostly djinn guide is addicted to Cheetos and American Idol and let’s just say that this in this case the literary creation didn’t fall far from the tree!). Amanda: An agent, definitely! I never really tried to go directly to an editor so I spent a long time writing books and trying to get an agent. Of course what I didn’t know at the time was that it wasn’t my writing that they were rejecting, it was my story and when I finally wrote the “right” story, that’s when I got an agent. Amanda: This one was a slow build. I have always loved old TV shows like Bewitched, The Ghost and Mrs. Muir and I Dream of Jeannie and then when I was looking for an interesting mythology to explore I got hooked on djinns. From there I just started to explore what it would be like for a regular girl to have a secret world and a secret power that she had to hide from everyone! Amanda: My publishing sales always seem so unexciting because I live so far away from America where my agent and publisher are so we do everything by email! Anyway, my agent had told my editor that I was doing a middle grade book and would she would be interested in seeing it. She was and while she loved the idea, she asked for some revisions on the first few chapters and also asked if I had considered making it a series. So I went back and revised it and then wrote a very brief summary for two more books and we sent it back to her. A few weeks later I got an email from my agent with an offer for a three book deal.